I shall not be so pessimistic in future when I see a cold north easterly forecast. So I arrived at the lake after work on Saturday evening and in all honesty I didn't fancy setting up on the end of the cold wind. I need not have worried as every peg was taken. The whole complex was very busy indeed. It is not really good practice to arrive with preconceived ideas on swims but for some reason I had one swim on my mind all week and had made plans on how I would approach it. 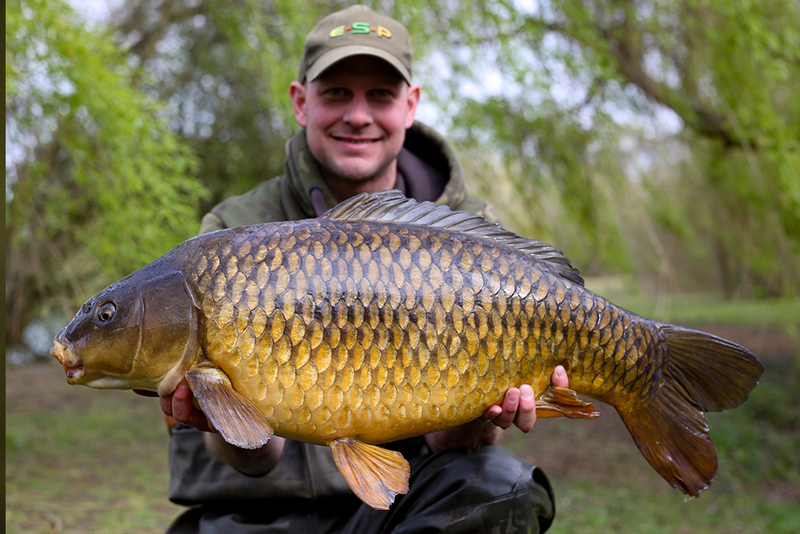 I soon found that my good friend Lee Birch was already fishing and had bucketed the swim for a move on the Sunday. When I told Lee that I had been thinking about the swim all week he simply said "well you go in there then, I don't mind". It didn't feel right but he genuinely meant it. Lee is a true gent and it was massively appreciated when I dropped into the swim the Sunday afternoon. 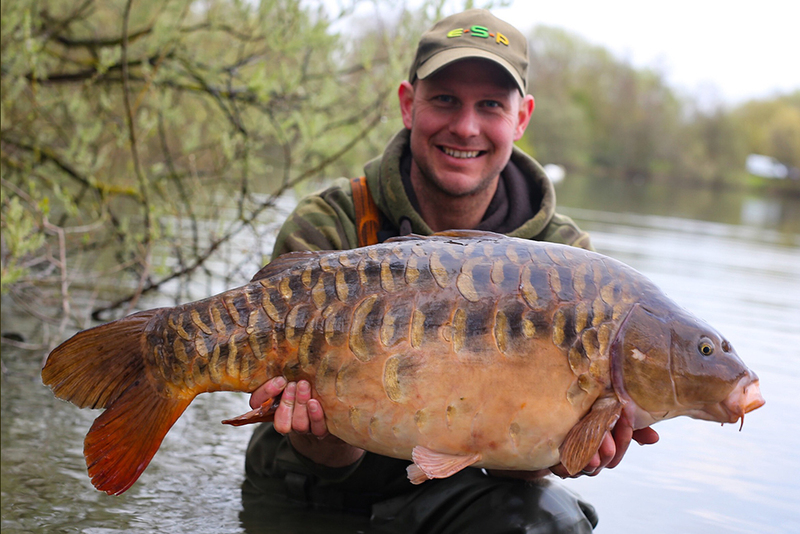 I had done the Saturday night on one of the other lakes on the complex and managed a nice scaly one over a bed of bait at 95 yards range after setting up in the dark. So I found myself setting up in a swim which I really fancied courtesy of good old Birchy. There were a few fish showing in the middle and Birchy had chosen to set up opposite me to allow us both to fish to where they were showing. The lake had fished fairly slow with just a couple of fish out the previous week. I decided to fish 3 rods on zigs and my 4th rod closer in over a lightly spodded baited area. The following morning there were fish showing all over in front of me and Birchy but neither of us has received a take. The dusty clouds evaporated and the sun beamed down over the lake raising the temperature instantly. I started to think about raising my zigs up to 1ft below the surface but before I had time to act and much to my surprise, my bottom rod ripped off. I soon had my first fish of the year from the venue in the net and one of the smallest in the lake at 21lb. 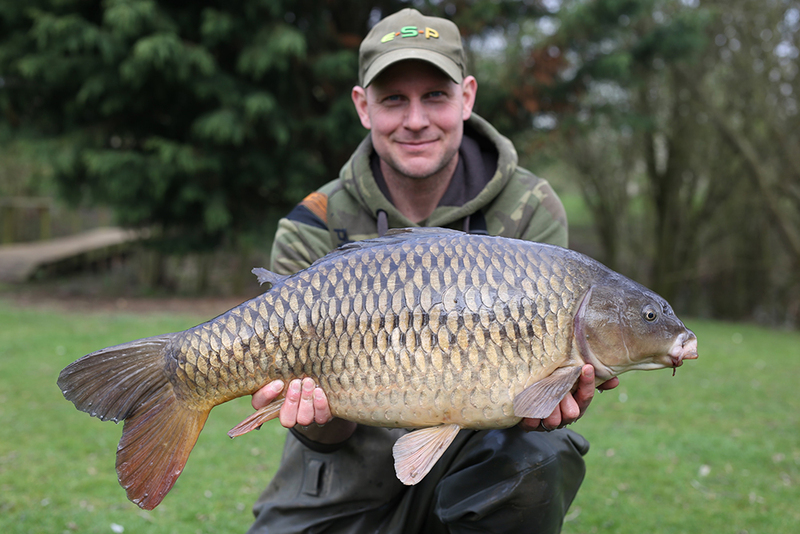 I soon had my first fish of the year from the venue in the net and one of the smallest in the lake at 21lb. I made the comment that it will probably be the smallest fish I would catch all season but that was short lived as at 3am the following morning my zig rod signalled a drop back and I soon had a mid double common in the net. Two fish in a trip from the venue is a right result but little did I know things were going to get a whole lot better. Later that morning, around 9am a few fish started to show short to my right. Way shorter that where my zigs were placed so I wound one in and flicked it into the ripples of a rolling fish. 10 minutes later and the rod was away. It felt like a good fish and I was ever so nervous playing it on a zig. 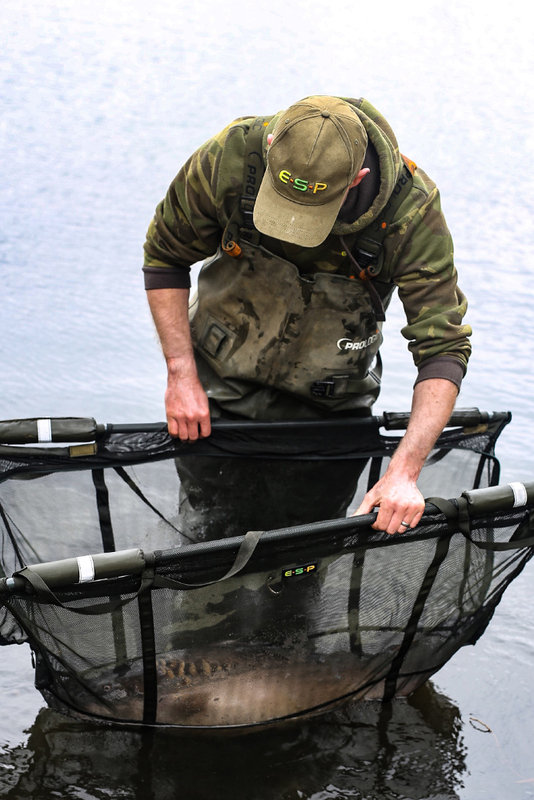 I need not have worried as all went to plan and I was soon gazing into the net at a nicely proportioned common of 36Lb 12oz. 37lb 12oz on a zig! Birchy had run round to assist with the photos and no sooner had he got back to his swim and I was away again. 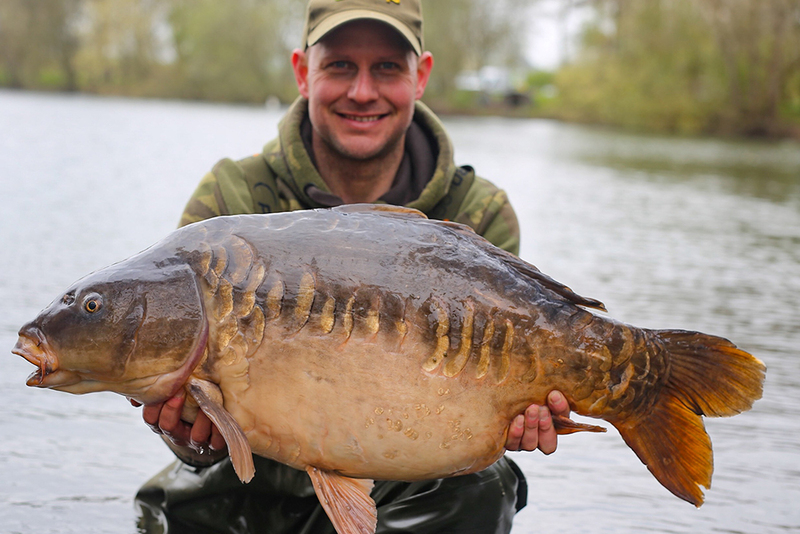 This time a very special one rolled over the net cord, a linear called Della at 32Lb 6oz. A couple of us had suggested to name the fish after a good friend Gary Dennis's wife Della had recently won her battle with the big C and it was Gaz's first fish back from hanging up the carp rods for 6 months to support his wife though the hard times. I really did not think the session could get any better when at 3pm, the bottom rod melted off completely out of the blue. 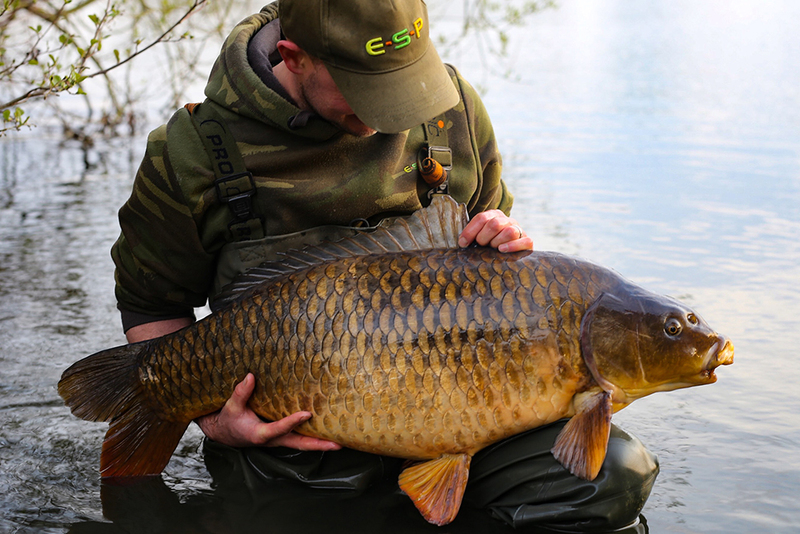 A fantastic fight was soon ended with an immaculate 27Lb common. Now this might be a good time to give you some background on the lake which had only done a hand full of bites on the bottom this year. Birchy had caught a couple on singles a few weeks earlier and I could count on one hand how many fish had been caught over bait this year. I had figured they simply don't want to eat a big bed of bait. In fact anyone who had put more than 10 spods of bait out had blanked this year. So I had soon figured the minimal amounts of bait, just a few accurate Spomb's was the way forward and it was clearly working for me. 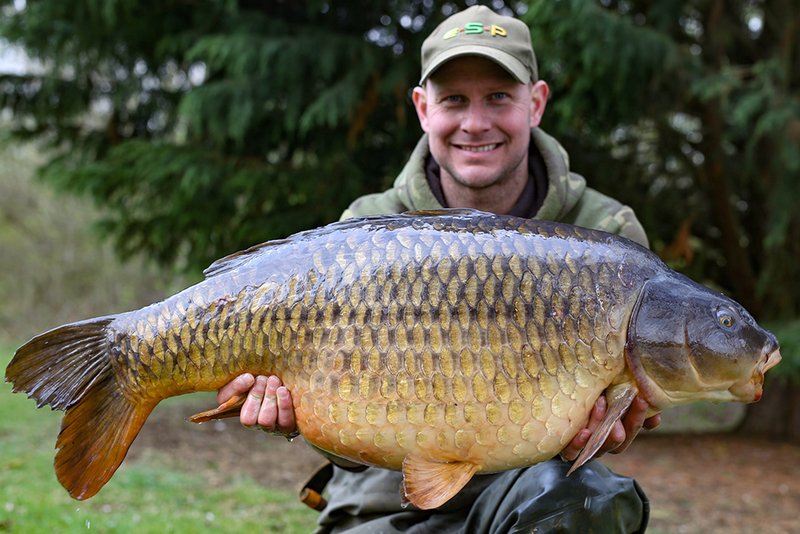 Especially as I only had to wait a couple of hours for my next bite which tipped the scales at 37Lb 2oz. My third thirty of the day. 37lb 2oz - and the third thirty of the day! I managed to wangle an extra night and this paid off when I had a beautiful 28Lb 6oz near fully scaled at first light before packing up and heading off to work with 7 fish under my belt. To put this into perspective I've done around 10 trips to the venue last year for around a dozen fish so I had nearly a seasons worth of fish in just a couple of days. I shall not be so pessimistic in future when I see a cold north easterly forecast.